Update: I tried following my own instructions.....ugh....PAIN. So I bundled everything up in a nice self-extracting install file. MUCH EASIER to install on a Windows device now. It's really great but my immediate first comment is - can you add the ability to load an octgn file? Right now I can't access my decks in txt forms because thronesdb is down. I don't actually save txt files and so I can't use it to edit my decks. Seems to me, if the point is to have an offline editor - it's best to be able to also load (and not just export) octgn files. Also, is updating new cards only manual? Each card in Wolves of the North would have to be added individually? That's a great idea, and it never crossed my mind because of the way I was using the app. The app itself saves decks as flat text files, but these are slightly different from the exported text files (that's why I had the exported decks folder vs. the decks folder). So I'd been saving and tweaking my decks with the app through the decks folder, and then just exporting my changes as a new Octgn export. But I like your idea....yeah, I can make it so that you could load in an Octgn file and then tweak it that way. Give me a day or so and I'll see what I can come up with. Right now, updating new cards to the 'database' is manual only. It's a labor of love. I scan the new cards once I've bought them and then I add them in one-at-a-time by dragging the scanned image where it belongs and then filling in all the information for the card. Press the Save Card button and then on to the next one. After I have them manually entered this way, I then have to take the Octgn set for the new pack/deluxe and put it through another tool I wrote that strips out the card names and their unique Octgn ID numbers and save it as text that gets added to the Octgn.txt file. This is done so the Octgn exports continue to work properly. The add new cards tab was how I initially built the Cards.txt file that the program uses. My intentions are to keep the files up-to-date as each new chapter pack / deluxe box comes out and then release a self-extracting file to my Google Drive so anyone that wants to keep using the app just needs to download the latest 'patch' to remain up-to-date. Thank you very mucho, Gamer257. That´s exactly what I was looking for. Your labor is much appreciated. Might be a dumb question....but why not just use OCTGNs deck builder? you don't need to be online for that. Pretty much looks exactly like what you just recreated. Yeah, this true...but Octgn doesn't allow me to analyze the deck once I've built it, or draw sample starting hands to see how my setup is gonna go. And really, I just wanted an excuse to program something in Object Pascal. And my version tries to guide the user into building a proper tournament deck. It edits the deck as you build it. As far as I know, Octgn does not have this. This stupid cold has me running a day late. Next version is almost ready. Save/Load octgn decks is implemented. Got rid of the Export decks menu tab...everything is now under the files menu tab. Files are now either octgn or text (text files can be printed out for a tourney deck list if you need it). And finally, finishing up card names so they now show where they come from...for example, Will (Taking the Black). Needed this for when we see identical card titles, ala Catlyn Stark. Version 1.0.2.2 is now available! If you've downloaded before, just grab the Update_v1.0.2.2.exe file. 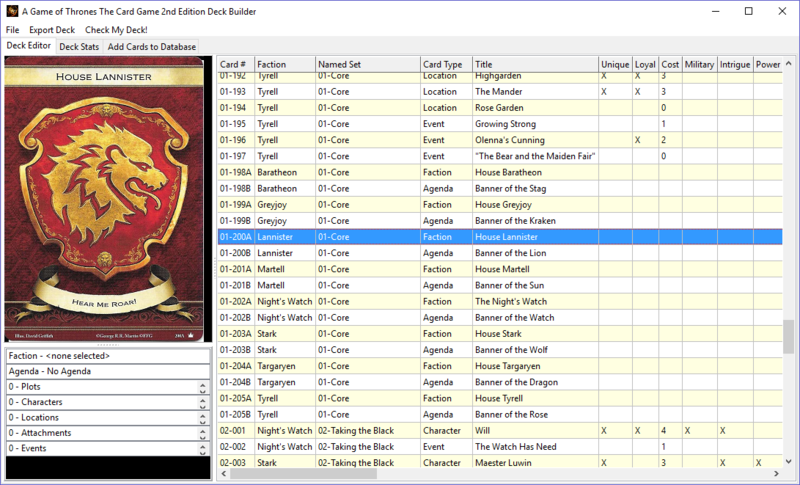 If it's your first time checking it out, grab the AGoT_LCG_Deckbuilder_Setup.exe instead. As always, constructive criticism, feedback, suggestions are always welcome! Well, I have Wolves of the North entered into my offline deckbuilder, but I'm waiting for the Deluxe to be released on Octgn so I can incorporate the Octgn deck saving/loading with those new cards. Just checking, but do you guys want me to continue with this for the community? Does it have value for you all? I'm going to keep doing it for myself, but I won't keep posting about it here if there is no interest or value to the community. Let me know! 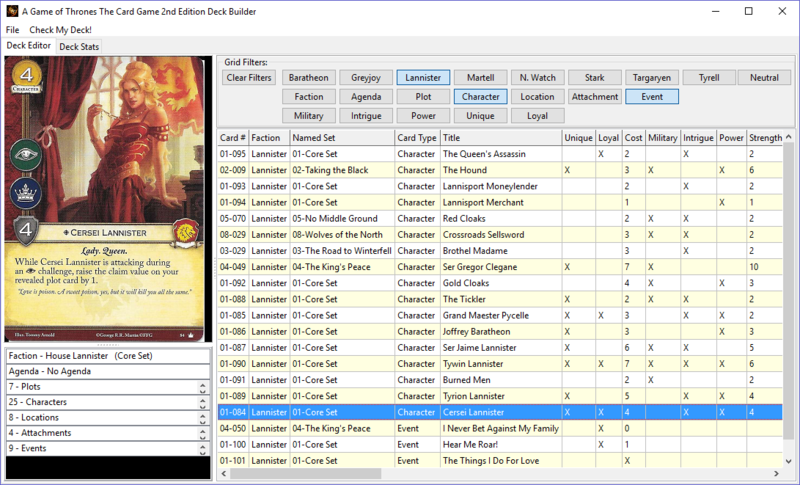 Offline AGoT LCG Deckbuilder version 1.0.3.1 now available! - Added Wolves of the North Deluxe Expansion! to add the cards to the database. Got rid of the clutter. - Added Grid Filter buttons. I think there's value. I usually have internet connection so I don't usually need it, but I think it's cool. Version 1.0.3.2 is now available. - Added a Traits filter dropdown list to the Grid Filter buttons section of the app. should be legal to play online in Octgn. - Added Sets Filter button. Offline deckbuilder now up-to-date with Calm Over Westeros. 2 files on the Google drive. Calm Over Westeros setup file contains the the images and DB files to bring the app up-to-date. And as always, if you find any bugs or errors, then please let me know. I do it for the love of the game. I've been toying with that idea myself, and you're not the first to mention it. Right now, I don't know if I have the time. Work is requiring me to learn and become a .Net developer, so currently my focus is there. But future, I would like to port it.